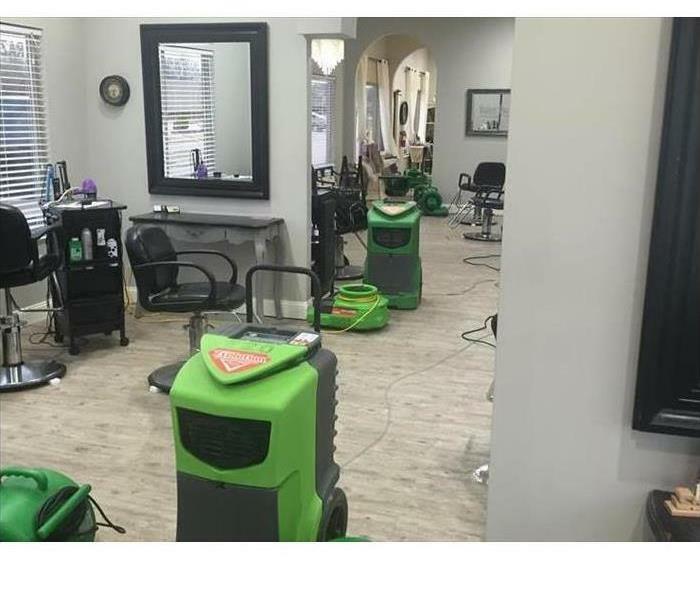 When a water loss occurs and damages your commercial property, it is important to call SERVPRO of West Hamilton/Oxford as quickly as possible. Water damage left sitting for too long can cause secondary damages to your property. Give us a call today! 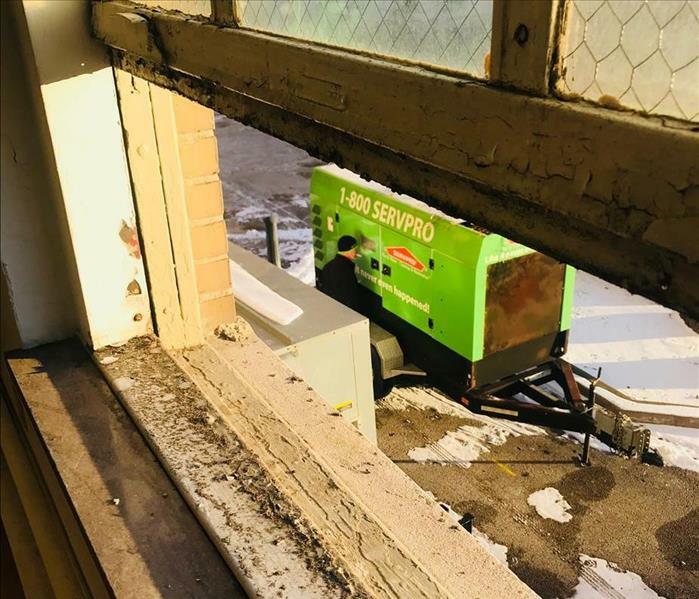 Our SERVPRO of West Hamilton/Oxford team is hard at work on a commercial restoration in Hamilton, OH. Our team takes great pride in the work we do, and our team can handle ANY size loss that you might experience. Read more about our Commercial Services HERE. 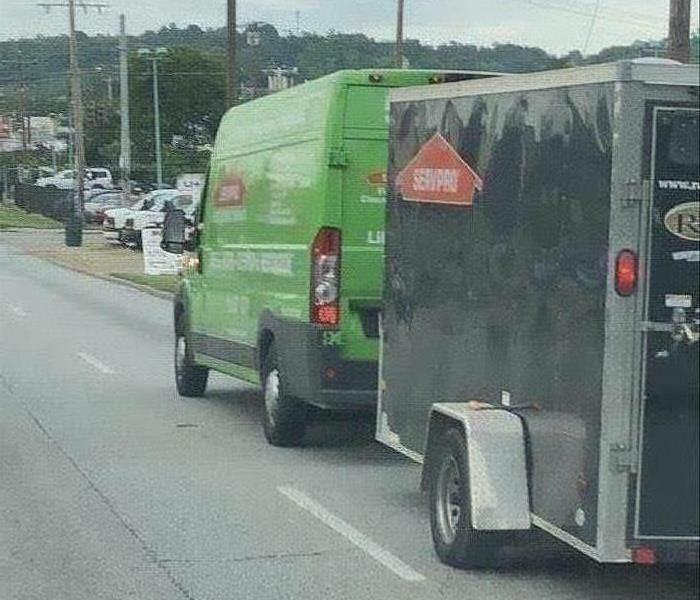 No size loss is too large for our SERVPRO of West Hamilton/Oxford team to properly take care of. Our team has the equipment and knowledge to handle any size loss you might experience on your property. 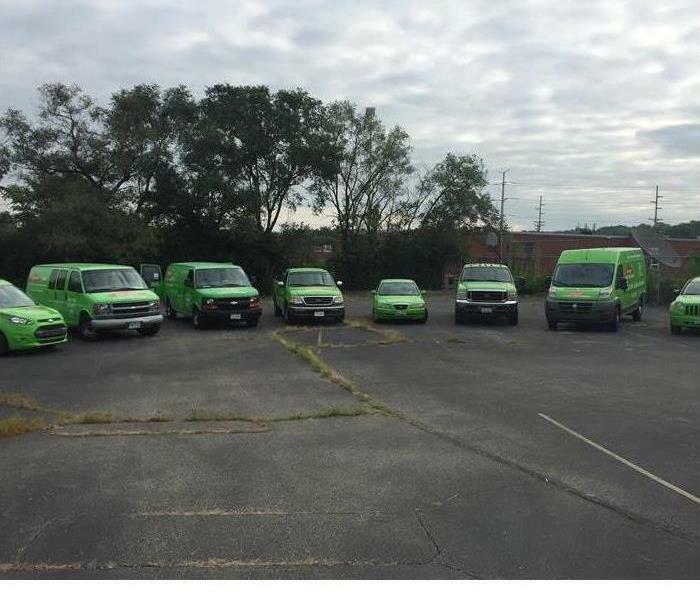 Our SERVPRO of West Hamilton/Oxford team is heading out for a busy day in the Hamilton, OH, area! 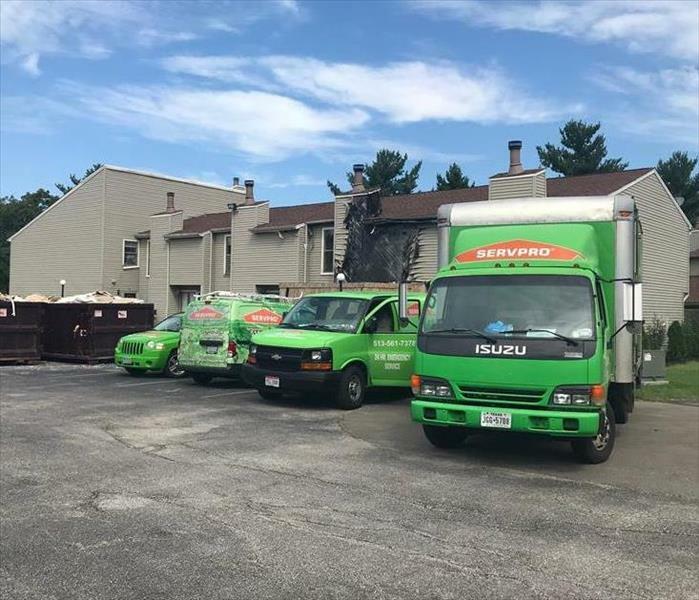 If an unexpected loss damages your home or business, remember that our SERVPRO team is only one call away! 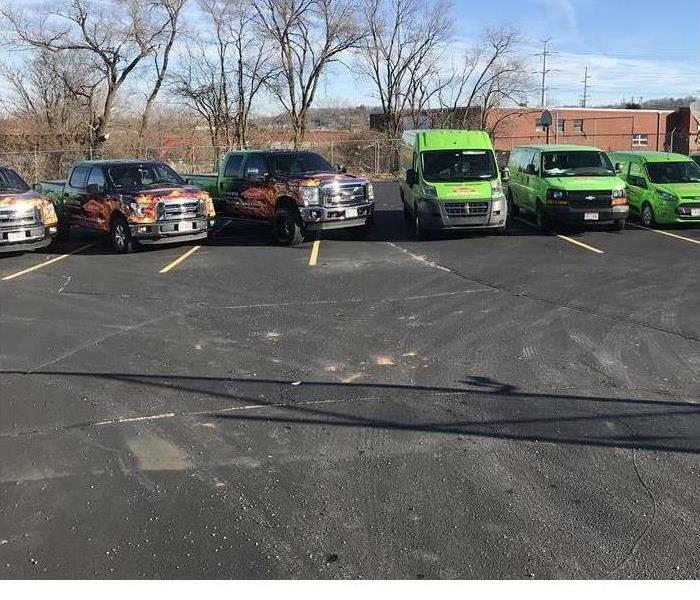 In sunshine or storming weather, our SERVPRO of West Hamilton/Oxford team is always on standby and ready to respond. Our team understands that disasters don't wait for a good time to strike, so our team is available 24/7/365. 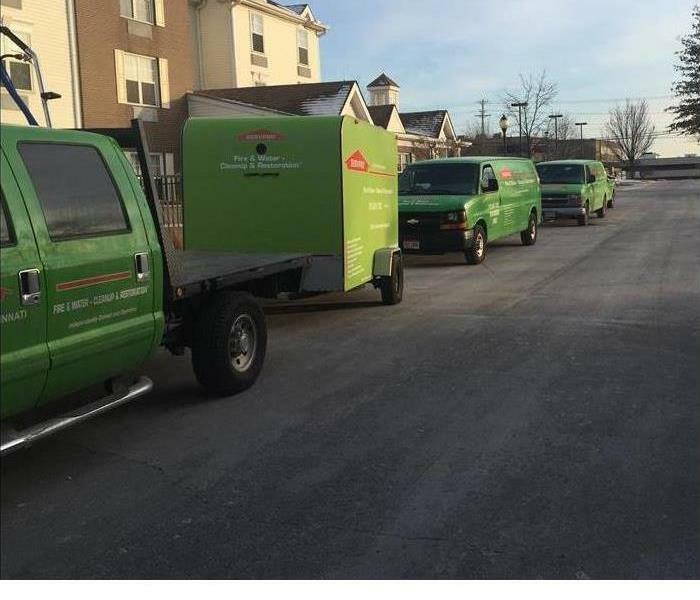 After a severe water loss, our SERVPRO of West Hamilton/Oxford team was called to action. Our team responded and began by extracting the standing water before getting the drying equipment up and running. 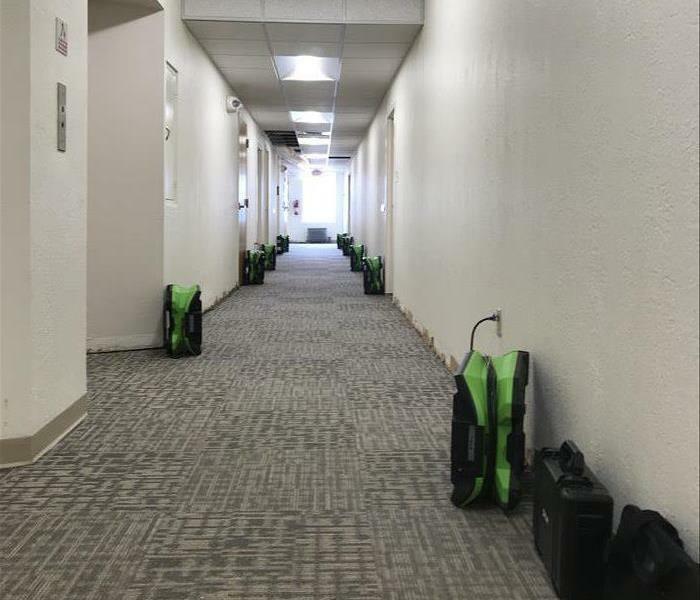 If you experience water damage, our SERVPRO team can help! After the fire was put out, our team was called to action. 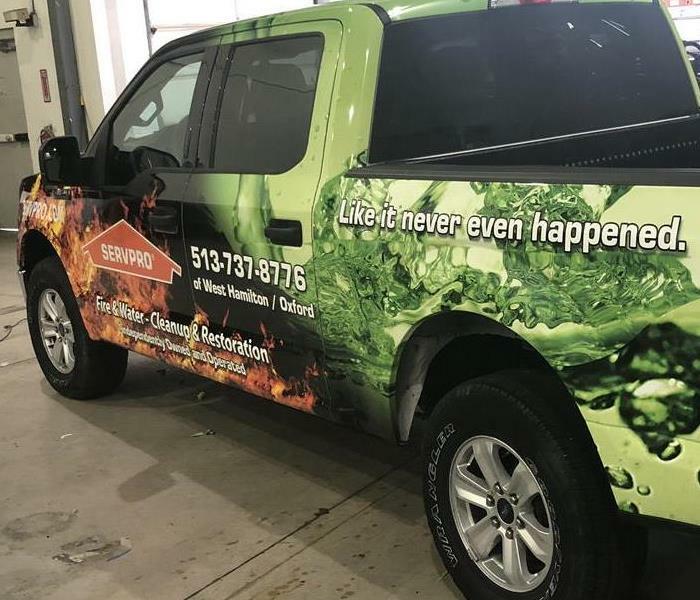 SERVPRO of West Hamilton/Oxford has the best equipment and expertise to handle ANY size fire damage loss. If you experience a fire loss to your home or business, our team is "Here to Help." 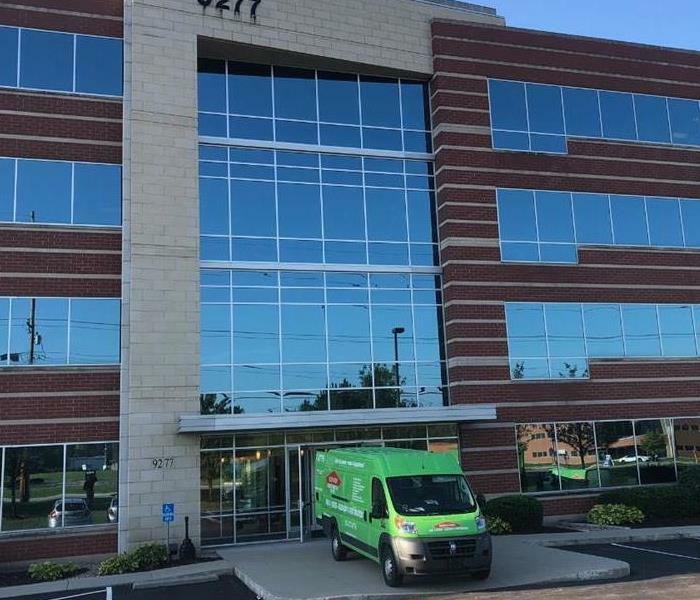 After a commercial water loss, our SERVPRO of West Hamilton/Oxford team was called! Our team responded and got to work. Remember, if you experience ANY size water damage in your home or business, our team can help! 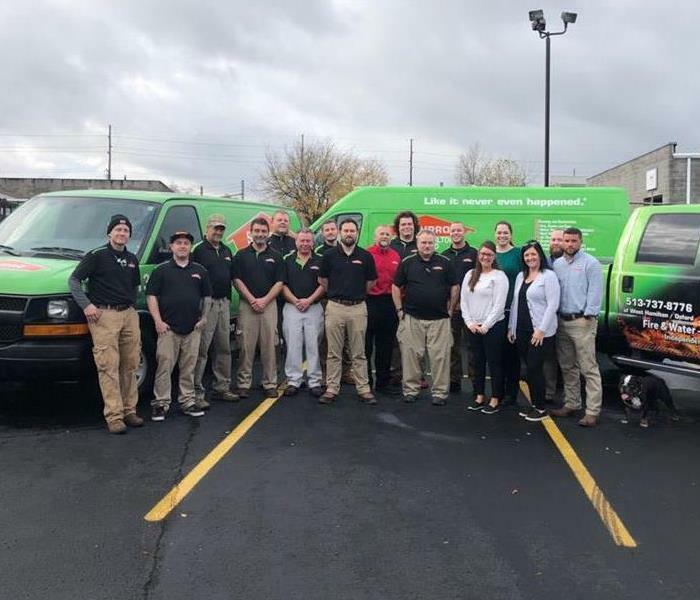 Our SERVPRO of West Hamilton/Oxford team is happy to serve you and out community! 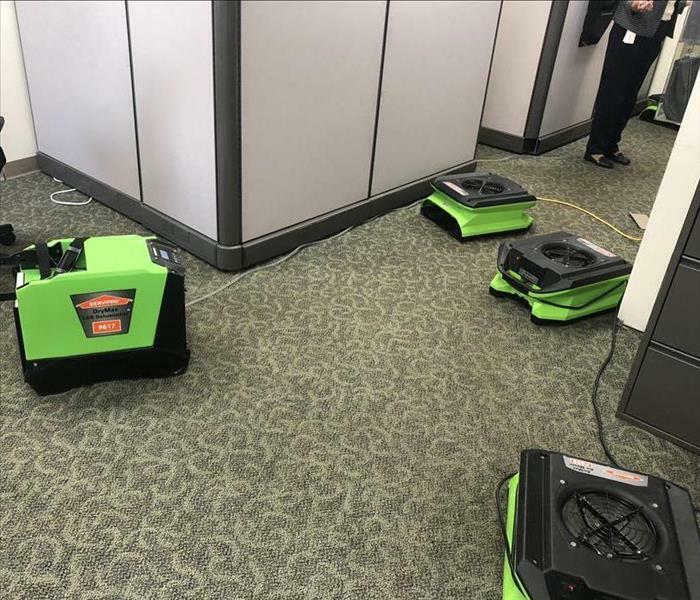 If you experience any size residential or commercial loss, give our SERVPRO team a call and we will make your damage "Like it never even happened." 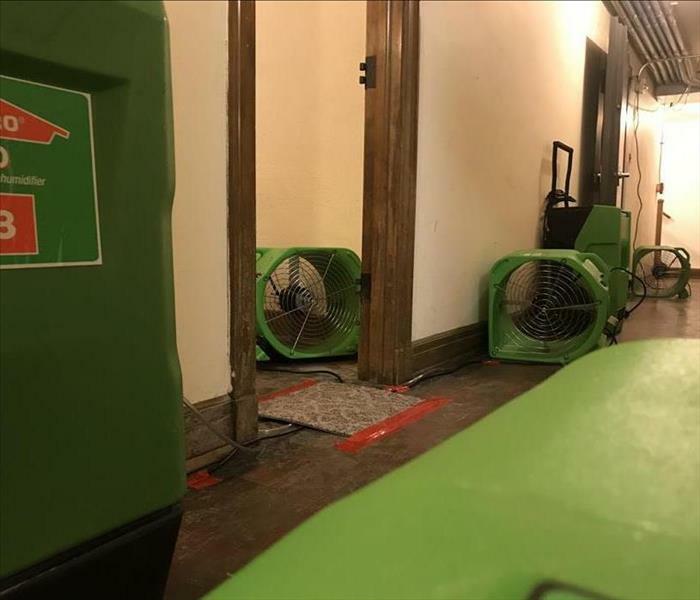 The SERVPRO drying equipment is up and running on a commercial job site after a water loss. 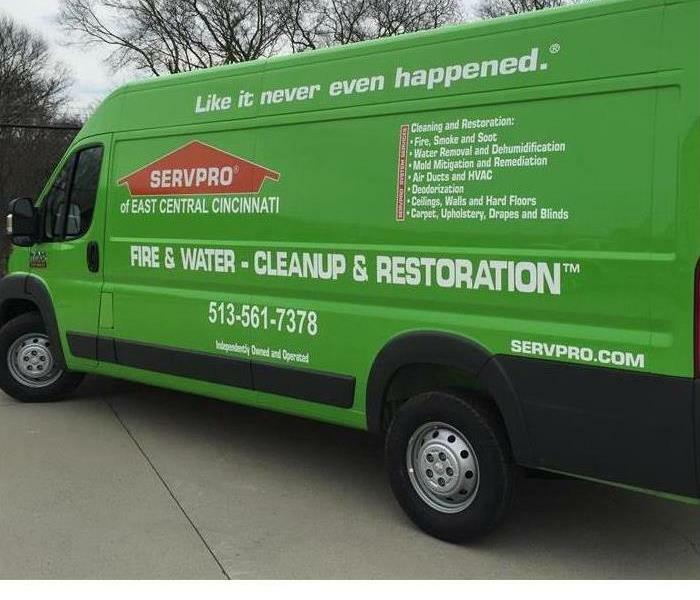 If you experience a water loss in your home or your business, give SERVPRO of West Hamilton/Oxford a call! 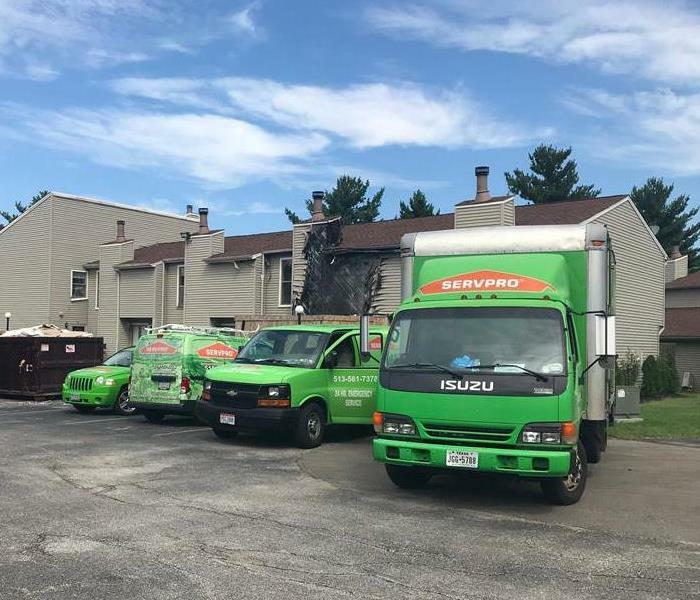 Our SERVPRO of West Hamilton / Oxford team is always ready to help. If you experience water, fire, or mold damage, our team is always ready to respond and make your loss "Like it never even happened." Disasters never strike at a convenient time. That is why it is important to know that SERVPRO of West Hamilton/ Oxford is always on standby and ready to respond. We are Faster to Any Size Disaster, 24/7/365. 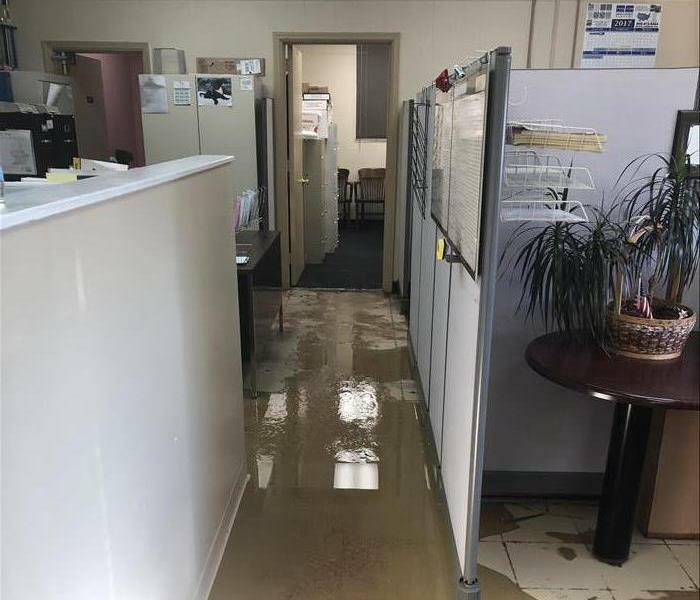 After a call from this Hamilton business, our crews were on site removing water from these offices. We worked for several hours extracting water and setting drying equipment. This home suffered from a water loss. Flood cuts were performed as mold and mildew was found growing. The drywall was removed to prep for proper cleaning and treatment by the professionals at SERVPRO. 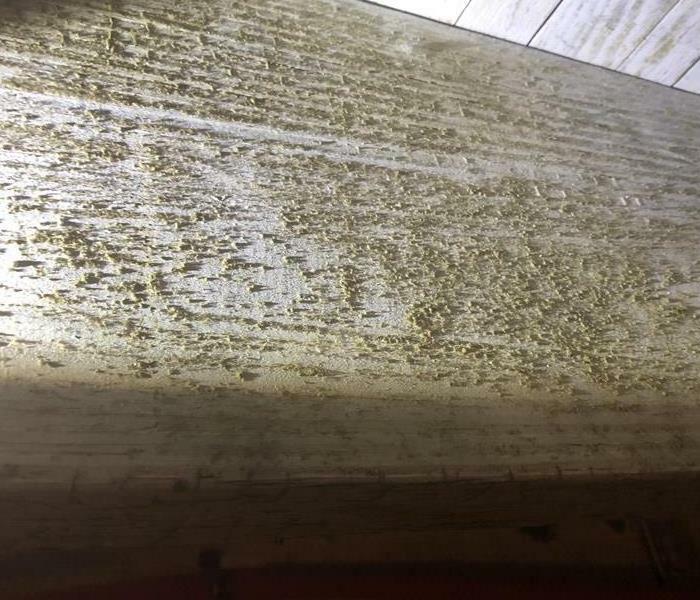 This beam suffered from mold damage after a water loss. The team at SERVPRO responded to the home to find mold and mildew growing from where the water was not dried properly. The team has special cleaning techniques and equipment for your Mold Remediation. Our crews spent the weekend working hard on this Hamilton Apartment building after a pipe burst on the top floor. After we extracted the water in the affected units, and did the necessary demo, our crews set drying equipment to ensure that we prevented any secondary damages. After a candle caught a curtain on fire it was not long before this Hamilton apartment was engulfed in flames. The Firefighters fought hard to put it out and when they did we were able to get in and assess the damage. This was about a 6 month project from start to finish. 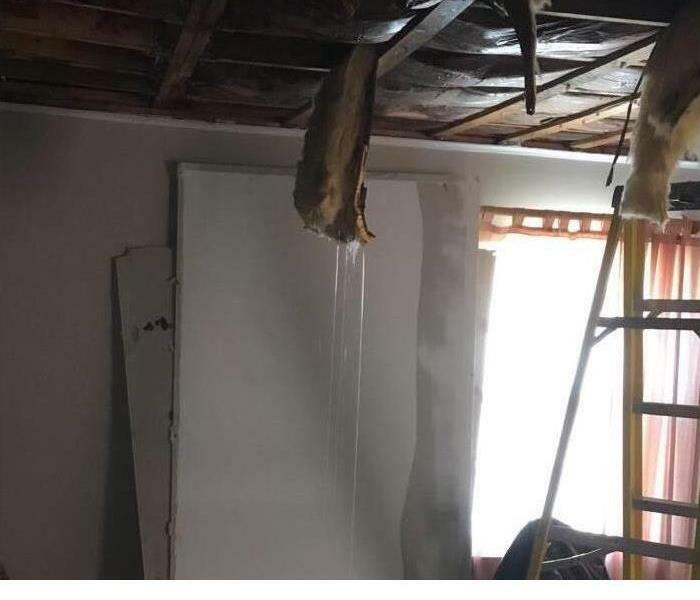 In this image, you can see insulation that has been soaked by a heavy water loss. If you have a water problem like this in your home, give us a call. We are faster to any size disaster. When this medical facility experienced a large water loss, we discovered the wet documents pictured here. We were able to assist in restoring these documents. 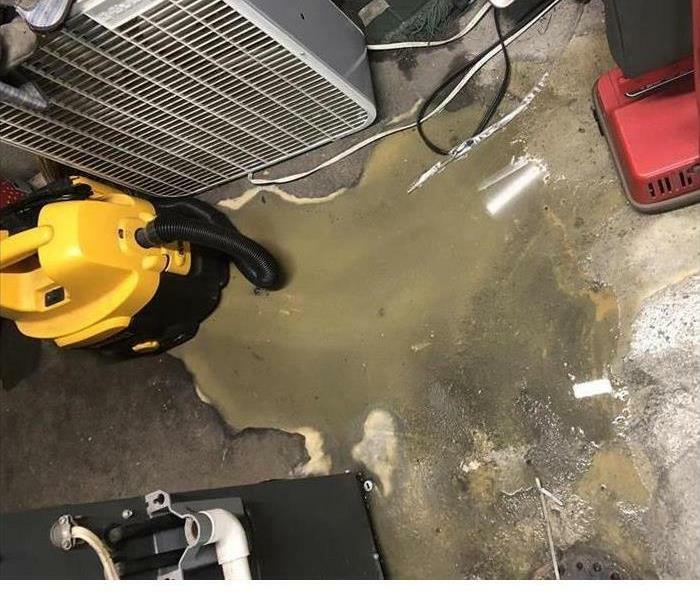 If you have a water loss like this, call SERVPRO. Our team is equipped and ready to handle any size water loss, any time. 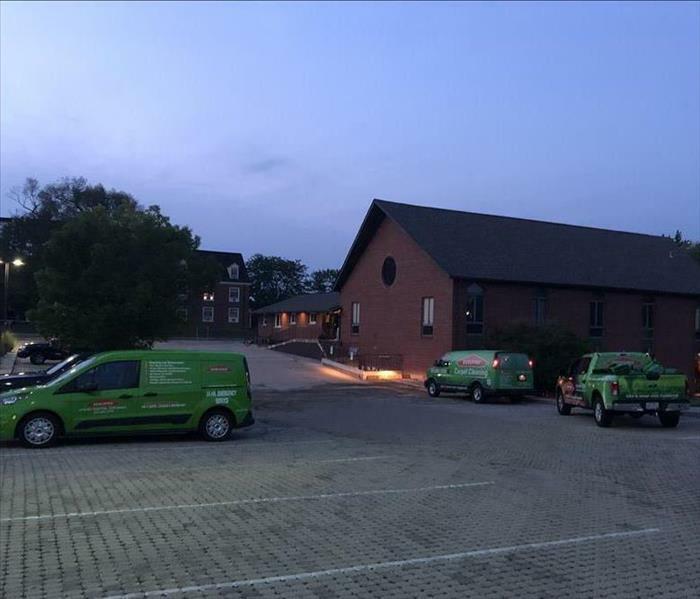 There was a large water loss at this local hotel and our team delivered on a fast response and a speedy restoration. Our team was called in to restore this salon after a water loss. We were on site quickly and got right to work getting the place dry. We used the equipment you see here to help do that. When we had serious storms in 2016 there was a lot of damage in our community. It was a difficult time, but thanks to the relationships we have with other SERVPRO franchises, we were able to come together to restore our community. Thanks to the relationships we have with other SERVPRO franchises, dealing with the storms we had in 2016 was a little easier. We were able to come together and restore our community after a major disaster. 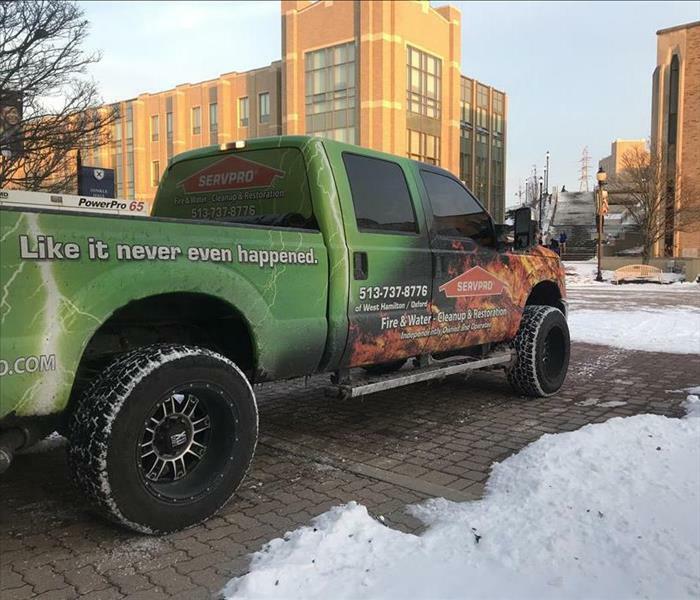 SERVPRO of West Hamilton/Oxford was extremely busy during the first week of 2018 due to sub-zero temperatures and had to utilize a large generator to supply a commercial project. If the winter storms cause problems for you, give us a call. 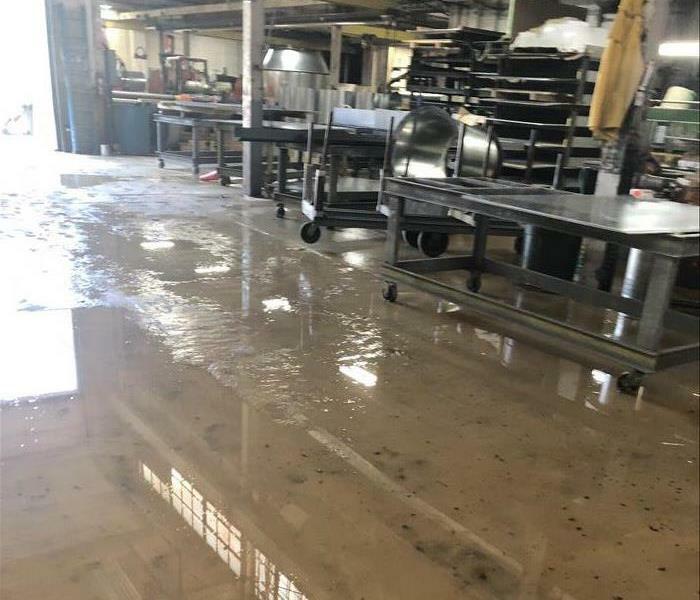 When our team arrived at the facility after it suffered flooding from storm drain backups caused by heavy rains, the first thing we needed to deal with was the standing water that was in the building. We have various vehicles ready for your mold loss no matter when it may strike. Make sure to wave if you see us driving around town and don't forget to call us when in need of help. This Ram Promaster is a great addition to our fleet allowing us to use it for many different job types. If you have a mold loss, call us. We are faster to any size disaster. We are available 24 hours a day, 7 days a week, 365 days a year to respond to your call. Our fleet is always ready to roll when you have a mold loss in your home or business. 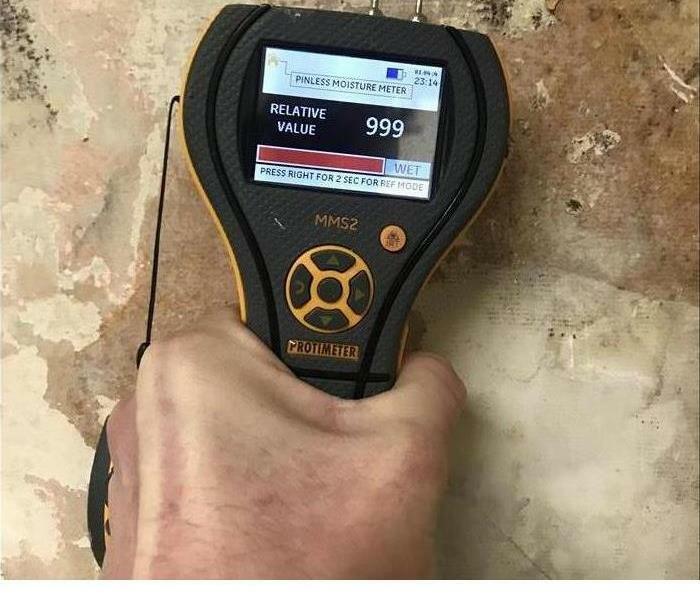 We use tools like this to help find the moisture you can't see just by looking because mold grows quickly in the presence of moisture. In order to deal with mold, the moisture at the root of the problem must be addressed. A fire broke out at a local hotel resulting in water damage to surrounding rooms. 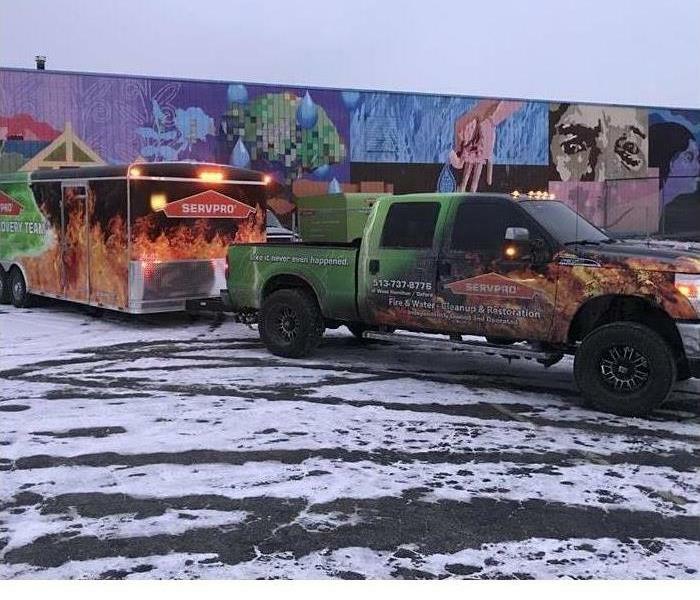 SERVPRO can take care of your water damage after a fire and also dry ice blast the smoke damage on the exterior of the building. 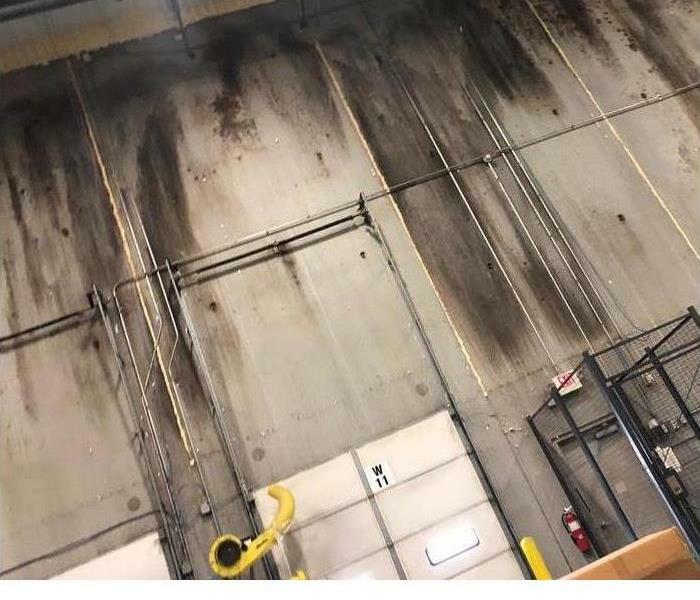 This factory suffered from smoke and soot stains after a large fire. The team at SERVPRO responded quickly to the call and began cleaning the ceiling and walls. For your fire restoration needs contact us anytime 24/7. 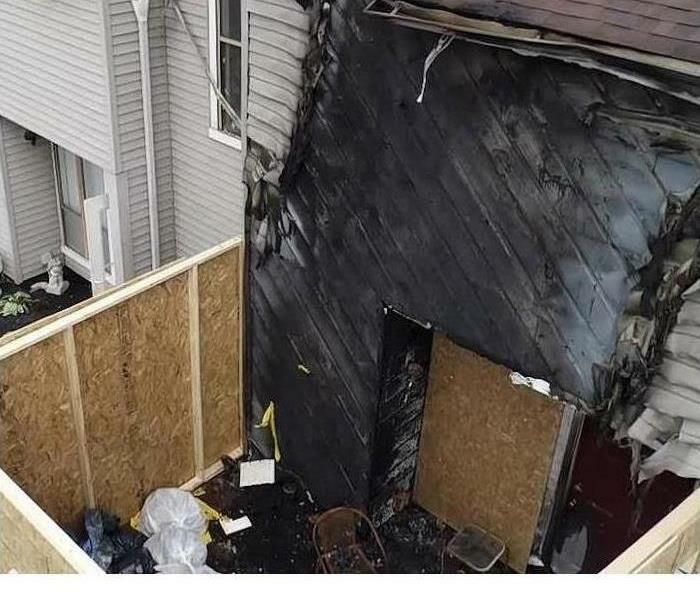 This apartment building suffered smoke and fire damage and had melted siding after a large outdoor fire. 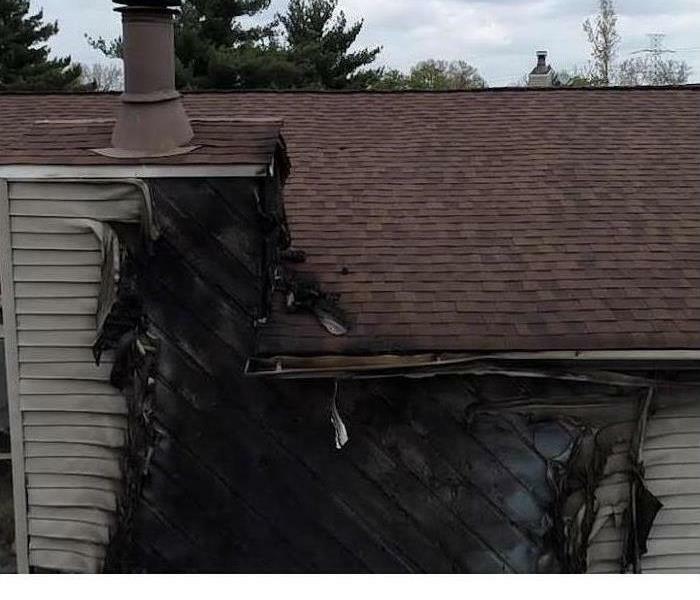 If you have fire damage like this, give the pros at SERVPRO a call. We are faster to any size disaster. This home suffered damage from an outdoor fire. 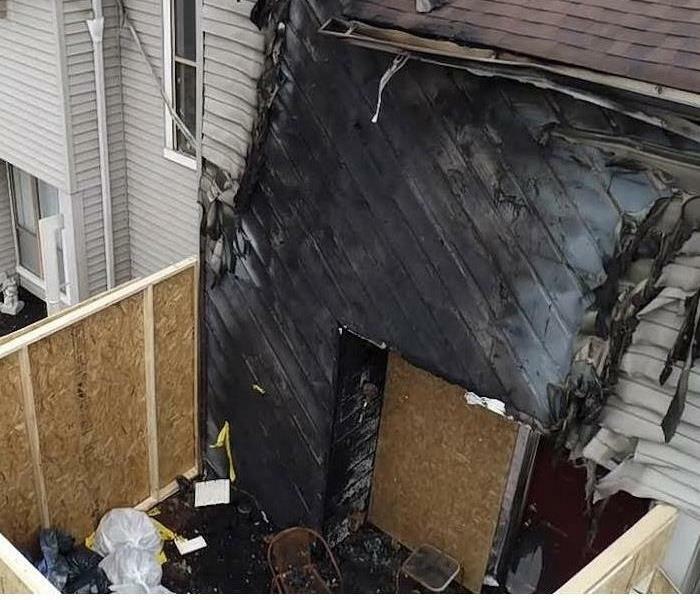 All of the siding on the back of the house was burned. SERVPRO responded and immediately began clean up procedures. If you have fire damage, give us a call. The flooding you see in this commercial building was the result of heavy rains that caused storm drains to back up. The backup caused a stormwater intrusion. If this happens to you, give us a call. 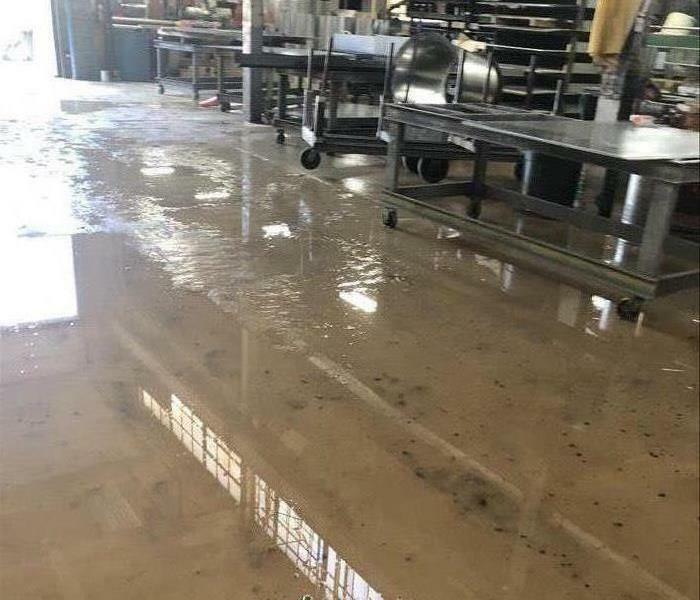 When heavy rains fell on our area, the storm drains began to back up and caused a stormwater intrusion that flooded this facility. 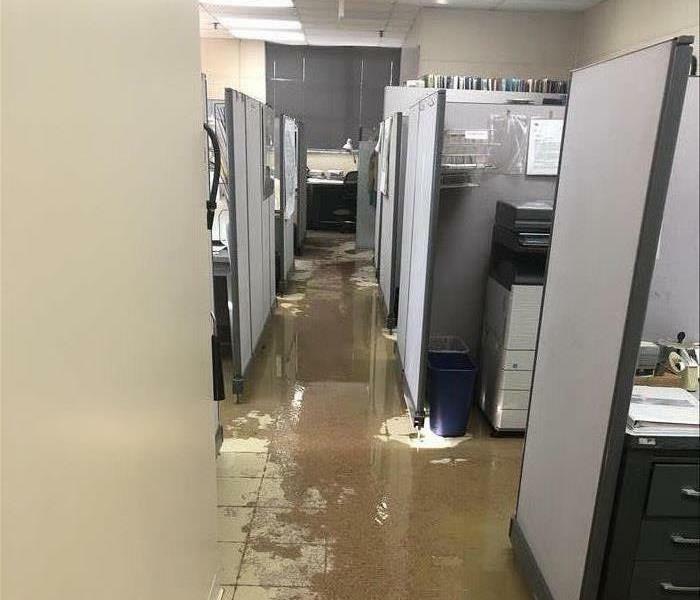 As you can see, there was a lot of standing water in this office when we arrived. 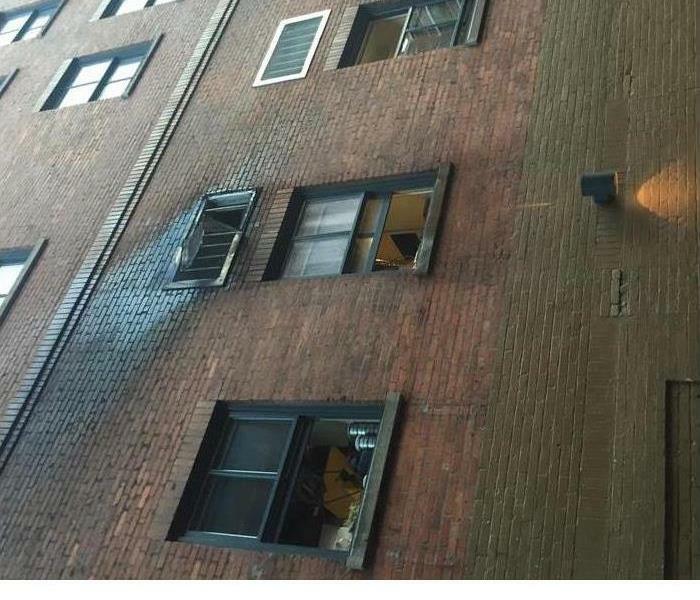 This building suffered flooding from a backed up storm drain during heavy rains. Our team was brought in to handle the cleanup and repair of the facility. 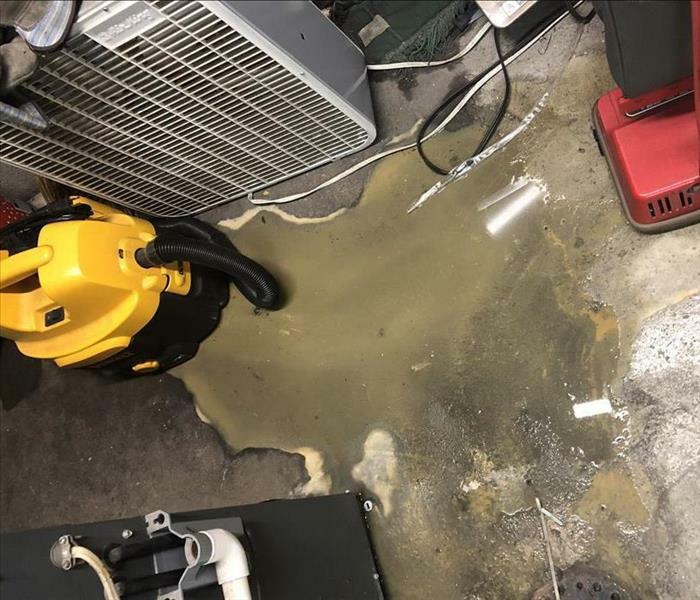 If your business suffers a loss like this, call SERVPRO! 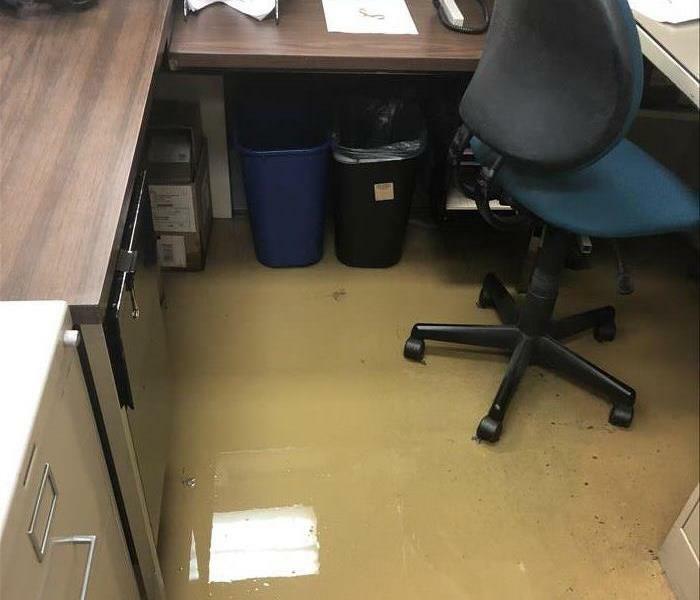 When heavy rains caused the storm drains to back up, this office was heavily flooded. As you can see, there was standing water still in the building when we arrived. 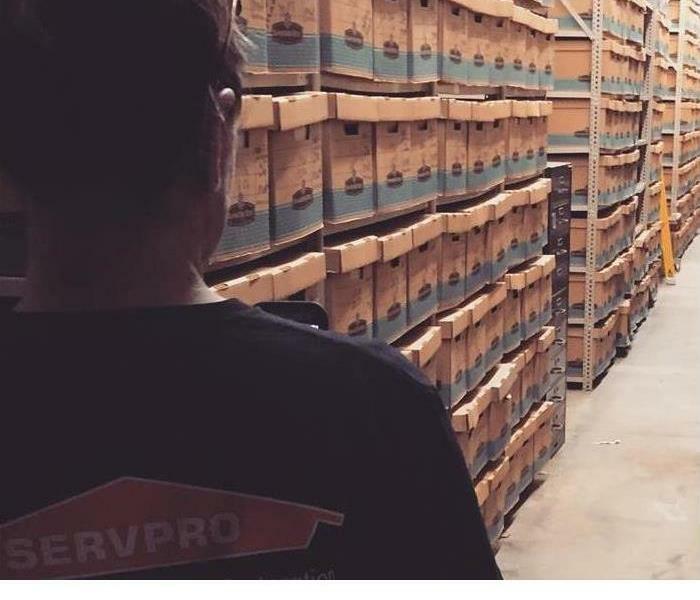 If your business suffers a loss like this, call SERVPRO. 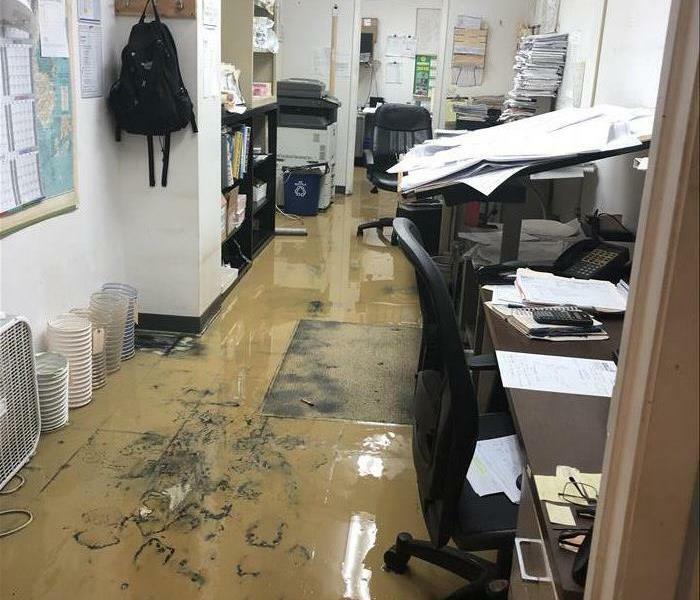 As you can see from this image, when we arrived at this office after a water loss, there was still water standing in the floor. 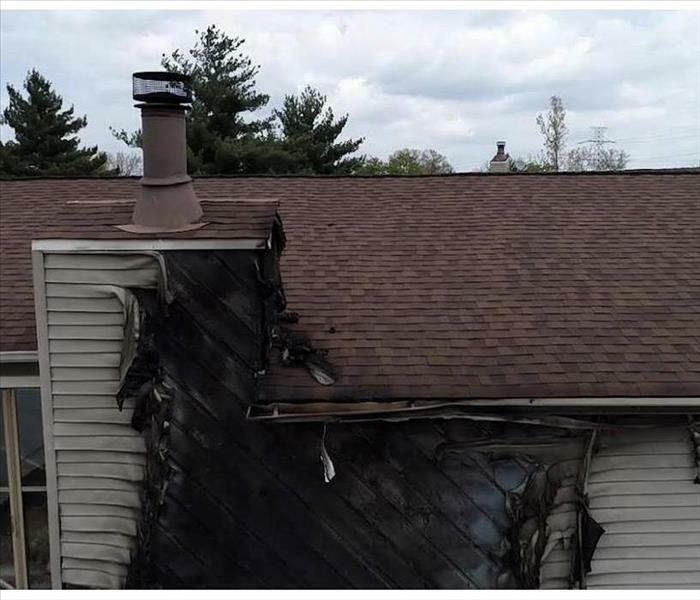 If you have a loss like this, give us a call! We responded to this flooding and were able to extract the standing water and repair the damage quickly. We had them back up and running in no time! 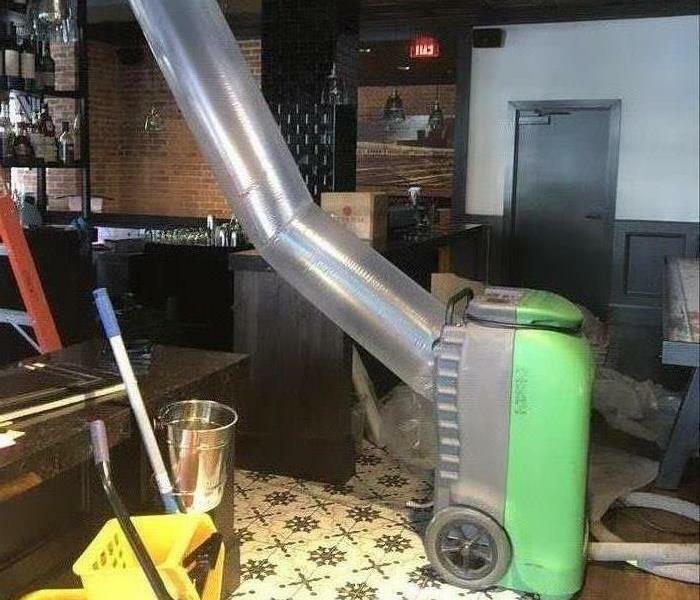 Call SERVPRO. We are faster to any size disaster. In this image, you can see that this room had a lot of water in the floor after a large water loss. Extracting the standing water was our first priority when we arrived. Once we had done that, we were able to make the repairs quickly. When moisture is left for more than 24-48 hours, secondary damage such as mold can occur. That is why you will often see us using equipment, such as you see pictured here, to help dry up the moisture more quickly. As you can see, the wood pictured here was damaged when this structure experienced a large fire. Our team was on site quickly and immediately began working to remove the soot, debris, and damaged material. The factory pictured here suffered a large fire that left the walls charred as you can see. Our team was able to get all the damage repaired and get them back up and running quickly. SERVPRO of West Hamilton/Oxford joined in the 2017 4th of July parade put on by the great city of Hamilton we are proud to be in town and plan on being a part of the community for years to come. 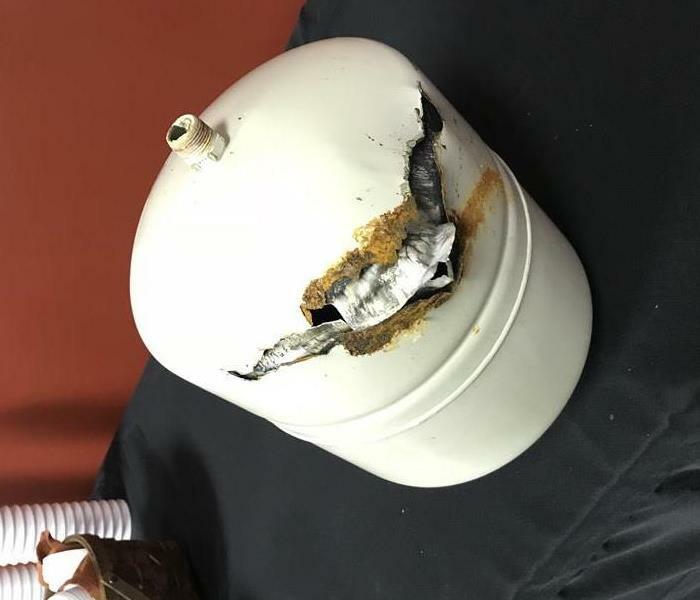 This is a picture of a thermal expansion tank that suffered a catastrophic failure resulting in a severe water damage at a local West Chester church. 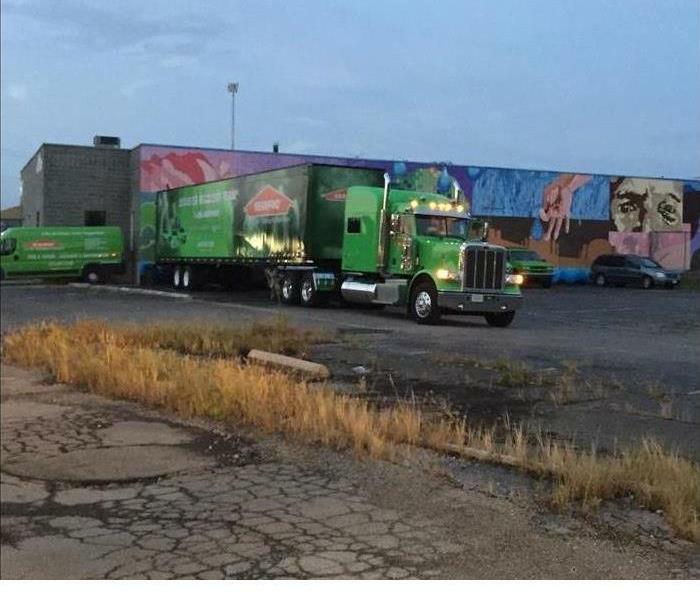 The SERVPRO of West Hamilton/Oxford team arrived quickly to dry the structure and remove the damaged materials getting it ready for services on short notice. 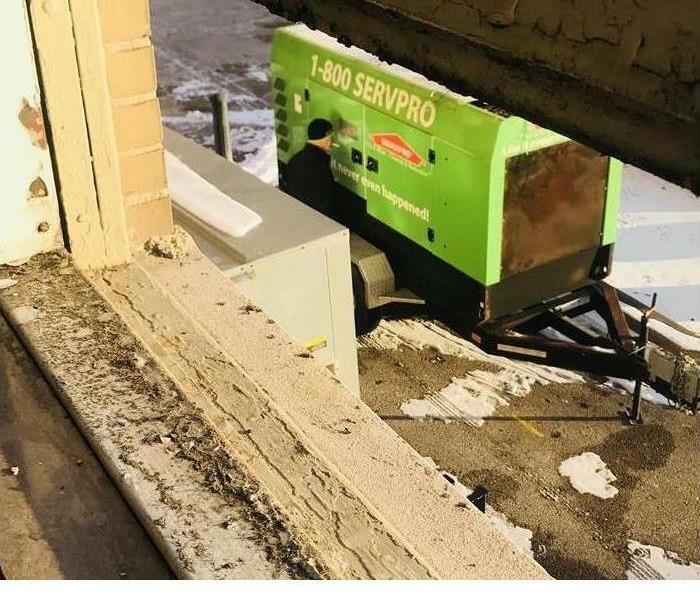 The SERVPRO of West Hamilton/Oxford crews responded to a water loss at a bank in downtown Hamilton on New Years Day. This flood was caused by a small supply line that had failed on the third floor. The water traveled though the plaster wall all the way into the basement.